The U.S. White House proposal on Monday to update the Corporate Average Fuel Economy (CAFE) standards to 56.2 mpg may be ambitious, but not out of the range of feasibility. Nor does have to cost an arm and a leg as some in the auto industry are crying. Under the proposed plan, automakers would have to bump their average fuel economy from 34.1 mpg by 2016 (currently mandated by law) to 56.2 mpg by 2025 (proposed). For the record, the auto industry will meet the 2016 mandate; otherwise, they would be crying foul already in 2011. Of course, the auto industry cannot meet 56.2 mpg with present technology in production, but they could with technology being developed and tested as you read this. Fact is, not all efficient technology is out in production. Furthermore, electrification does contribute immensely to the industry' average mileage capabilities. They just need to make it cheaper for the masses. It is ironic or perhaps a bit hypocritical the auto industry likes to tout its technical capabilities in marketing ads, but complains the moment any change to fuel standards arise. Their response seems no different than their union counterparts during wage and benefit negotiations. Of course, this 56.2 mpg is just an initial proposal from which bargaining will likelycontinue, and the auto industry will likely balk at any proposal that does not come from them. Still, the auto industry has at least accepted the reality that they must comply with CAFE, as they are proposing a target of between 42.6 and 46.7 mpg by 2025. Tell me, is that city or highway? Regardless, that would be an incremental average annual increase of 2 to 3 percent in a span of eight years from 2017 to 2025. Note the word, incremental. Truth is we need full-bore efficiency, not incremental tweaks, in my opinion; and we need it now, not in 2017 or 2020 or 2025. One justification for this viewpoint is, technology advancements thus far for the internal combustion engine have yet to run their full course; and there are companies out there right now with the solutions. That is why I say the mindset of releasing technology in measure is not helping the discussion at this point. It was amazing to me that many insiders at the Detroit 2.011 Autobeat Insiders Conference near Detroit were not aware of tech capabilities already out there. Fact is, the IC engine will be around a long time. Electrification was shown to retain a niche position for many years, possibly a decade or two. According to one of the presenter’s, Kim Korth, President of IRN Inc. the greatest changes will indeed come from the internal combustion engine, albeit unclear on details; and she‘s a researcher; and in my mind, a futurist I want to hear from again. From my perspective, though, all automakers right now are at the same level of technology release to the public, using turbos, direct fuel injection, variable valve timing, variable cam timing, cylinder shutoffs, etc. So, it is now obvious the automakers must go to the next level. 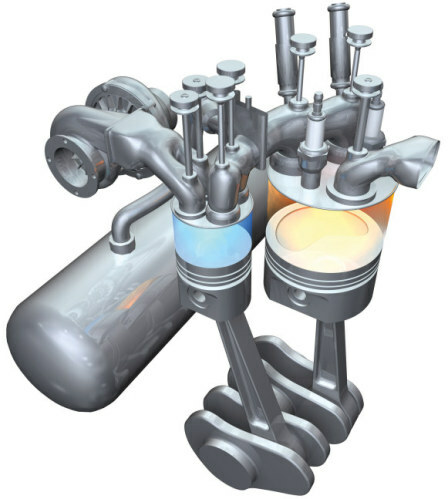 I have written about thissplit-cycle engine technology advancement for a few years now; and it is definitely a technology whose time has come; and likely a candidate to not only meet 2016 but 2020 and 2025 mandates. When I asked Steven Scuderi of Scuderi Engine in an exclusive TN interview at 2011 SAE World Congress in Detroit whether we would ever see 50 mpg and up, his response was a positive, “Yes.” He was reluctant to say that last year. So, I fail to see the need for panic by automakers at this point. The split cycle engine literally divides the four-strokes of the Otto cycle into two distinct phases: hot and cold, as in intake-compression; power-exhaust. This arrangement also avails the opportunity to make an air hybrid which would enable energy recovery and storage in the form of compressed air. And lest you think gasoline is the only fuel allowed, think again. The split cycle can also be used with diesels; and the engine is scalable from small engine to large engines for heavy trucks; meaning natural gas can also be used. Furthermore, the manufacturing is similar to what the industry is already familiar with producing. It would still enage turbos, direct injection, even shut down of cylinders and fuel, plus common materials used in today’s engines. The only difference would be the ATDC (after top dead center) timing of the spark whcih Scuderi has proven, and which accompanies the Miller effect. Ford has been in research with a Liverpool University on tackling the one IC engine component that has yet to really change - the spark plug. Think laser plugs where the energy and placement can be totally controlled. Oded Tour of Tour Engine has taken the opposed piston approach with his design of the split cycle engine. In this case, there would be two crankshafts but a common cylinder head for maximum thermal efficiency. Whether this is a game changer is difficult to say from my viewpoint, but it is worth mentioning. For the record, a non-condensing version of the engine will be running this summer at the Bonneville Salt Flats in Utah in an attempt to break the current LSR (land speed record) for a steam vehicle which is 148.308 MPH, achieved in 2009. For an automobile, the engine would be a condensing version. Furthermore, its ability to burn thoroughly would make it the cleanest of all combustion engines. Also, it would be able to burn all types of fuel. Already, waste fuel is being used to power the engine to drive a generator for electricity. I do not think the Chevy Volt would be out if it had not been for GM’s Wagoner (former CEO) saying publicly it would be out. I recall his engineers were balking internally, but in the end proved they could achieve great things. So, I say the auto industry should stop crying in its beer. They know that they placate the public and the government with incremental releases of engine technology. GM still has yet to release its HCCI (High Compression Combustion Ignition) engine that runs like a diesel but on gasoline. Well, it’s time to pull out all stops. Face facts. Electrification at this time is still too expensive for the masses. Take those government subsidies away and watch even the Chevy Volt sales nosedive. In my opinion, the high cost of lithium should give way to zinc-air which is plentiful in the earth and thus less expensive. Furthermore, there needs to be a change using ionic fluids as electrolytes to advance the speed of recharging; not to mention the use of ultra-capacitors instead of expensive Li-ion batteries for mild hybrids. Bottom line: Saying that a 56.2 mph requirement is too costly negates the auto industry’s own acceptance of passing on higher electrification costs to customers. And the technologies like the split cycle engine are not rocket science to the degree that they require expensive rare earth materials. Besides, companies like Scuderi, Tour and Cyclone Power have already placed their cards on the table for the whole industry and the world to see. Alex W. is scared he's going to lose all his money. I think Scuderi rules! Thank you Frank for the nice article. Regarding your question, the Tour engine could be design in the future to incorporate an air-hybrid feature, although the valve arrangements would be different from the one used with other split-cycle designs. In addition, the Tour engine would be design in the future to take advantage of the high-grade waste energy rejected by the engine hot block hosting the combustion and exhaust strokes. This secondary system will bring its own added efficiency. The Obama administration met with the big three U.S. car makers a week ago to talk about new attainable auto standards. The administration might wish all vehicles and light trucks to meet a 56.2 m.p.g. standard by 2025. The program would mean increased expenses for vehicles, but advocates say the difference could be made up by consumers at the pump. Numerous say the strategy is too difficult. "Face facts. Electrification at this time is still too expensive for the masses. Take those government subsidies away and watch even the Chevy Volt sales nosedive." Face facts: take away subsidies on gasoline and watch Volt and Leaf sales skyrocket.